If you have £1,315 ($2,213) and space to spare for a piece of automotive history, hit Ebay in the next 31 hours and grab yourself this 1998 Mini Cooper prototype shell. It's got a few surprises under the metal. BMW's Mini was designed by current McLaren Chief of Design Frank Stephenson, and the development was conducted between 1995 and 2001 by Rover Group in Gaydon, United Kingdom and BMW in Munich. Although the sportier German concept got the green light as opposed to Rover's budget car idea, this prototype certainly came from the British side. 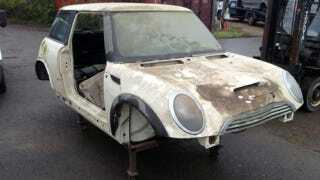 The seller believes this to be a one-off, a former running prototype of the Cooper S from around 1998, which was later stripped and "sent to a company to test the door seals". Seems likely as it wasn't until 1999 that BMW took over the project entirely. The details are certainly interesting. It's got a much more basic round headlamp under the cover, Rover-stamped glass and a different gas cap. The shape of the vents on front wings also got changed by the time the Cooper hit the showrooms three years later. While it certainly had a rough life in the last decade or so, this modern relic of the Mini-saga is by no means beyond repair. And since we're talking about a car located in Britain, putting a license plate on it doesn't sound far fetched at all. How Much Would You Pay For A Secret Mini Found In A Dead Factory? Good luck at bidding, the seller is "happy to sell abroad".